Gabrielle M. Duvall recently represented Southern Management Corporation as its structuring/non-consolidation counsel for a $1.5 billion loan portfolio funded by Berkadia Commercial Mortgage LLC through Freddie Mac. 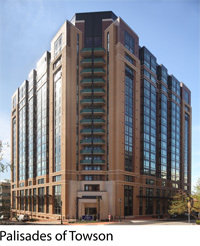 Southern Management is the largest privately-owned residential property management company in the Mid-Atlantic region. As the largest loan funded in Berkadia’s history, this portfolio is also expected to be Freddie Mac’s largest multifamily transaction eligible for securitization through its Capital Markets Execution program. The properties are located throughout northern Virginia and Maryland. The portfolio contains over 23,000 total apartment units and more than 250,000 sq. ft. of office and retail space. The newest property in the portfolio is Palisades of Towson in Towson, Maryland. Developed in 2010 by Southern Management Corporation, the class-A+ property is an 18-story, LEED Silver-certified apartment building on a 1.24-acre site. The building contains 357 units and luxury amenities, including a rooftop swimming pool, fitness center, and cyber café. The property is currently 96% occupied. Ms. Duvall counseled Southern Management on various aspects of the transaction, including bankruptcy-remote structuring, negotiation of loan and related closing documents, and rendering 70 separate, reasoned opinions necessary to the transaction. Getting a deal of this size and complexity done with all the diverse parties that were involved (intact and breathing at the end) is truly a Herculean accomplishment. . . , said David H. Hillman, Chairman and CEO of Southern Management Corporation.